Our minister is the Rev Brian Smyth. Brian has been married to Pamela for 31 years and she is a tremendous help and support to him in his ministry. Pamela leads the P.W., is a Lieutenant in the Boys’ Brigade, leads Trinity Tots and helps on the rota at youth club and children’s church. Brian and Pamela have 3 sons: Matt, Chris and Aaron. Matt is married to Victoria and they have one son called Arthur. Chris is married to Suzanne. Aaron is aged 16. Brian’s childhood days were spent in Rathcoole. He came to saving faith at the age of 12 at a Boys’ Brigade camp. As a teenager Brian was deeply involved in the life of the Belfast City Mission Hall in Rathcoole. He was a Boys’ Brigade officer, a Sunday school teacher and leader of the youth fellowship. Brian also had the opportunity to preach occasionally in the Mission Hall. Pamela was converted at the age of 15 and she attended the Belfast City Mission Hall in Ballybeen. It was through the work of B.C.M. that Brian and Pamela met and they were married on the 27th June 1987 when they were both just 19 years old. They set up home in the Fortwilliam area of North Belfast and became members of Seaview Presbyterian Church. In 1991 Brian left his employment to study full time at Belfast Bible College while Pamela studied part time. Following his studies Brian was appointed to the staff of the Belfast City Mission on the 1st July 1994 working in the Mountcollyer District of North Belfast. Brian enjoyed a fruitful ministry within the B.C.M. In the summer of 2000 Brian resigned from the work of B.C.M. and as a family the Smyths went to Switzerland to train for the work of Child Evangelism Fellowship. Having completed their training; Brian and Pamela worked in East Belfast with C.E.F. before moving to Donegal in the summer of 2002. The work in Donegal was blessed of God and soon Brian was teaching God’s Word in 20 schools. A thriving camp ministry developed and within a few years Brian and Pamela were leading 4 weeks of summer camps with over 200 children attending. While living in Donegal they were members of Trinity, Letterkenny. At the age of 41 Brian believed God was Calling him to the Ordained Ministry within the Presbyterian Church in Ireland. Brian completed his ministerial studies at Union Theological College in Belfast in May 2011 and then he served as an Assistant Minister in Glendermott Presbyterian Church, Londonderry. Having completed his Assistantship Brian received a Call to the Pastoral oversight of Trinity, Ahoghill Presbyterian Church. Brian was Ordained and Installed as Minister of our congregation on the 12th April 2013. Brian also has an active ministry within the four local primary schools and has served on the Board of Governors. 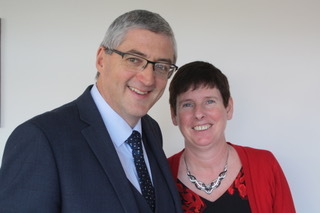 Additionally, Brian serves on the Governing Body of the Belfast City Mission.